Rockingham County Superior Court Judge William Delker presided over the Messmer, et.al. 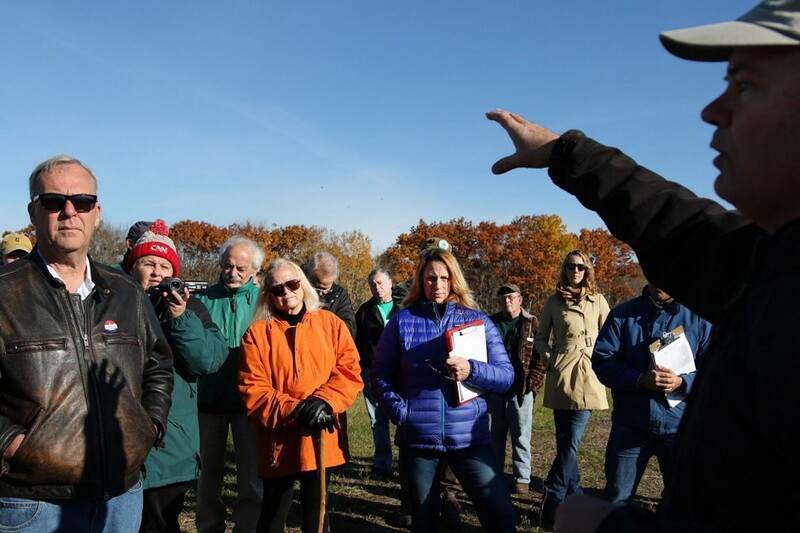 v. Coakley Landfill Group lawsuit heard in Brentwood on Thursday. The lawsuit was filed by state Reps. Mindi Messmer, Renny Cushing, Philip Bean and Mike Edgar, as well as James Splaine, a former assistant Portsmouth mayor and current police commissioner and the group is represented by Attorney Paul Twomey. The Coakley Landfill Group (CLG) is an entity formed in response to USEPA enforcement actions relating to hazardous wastes dumped at the Coakley Landfill Superfund site in North Hampton, New Hampshire. The Town of Hampton is an intervener in the case and is represented by Attorney Mark Gearreald. Messmer et. al. v. Coakley Landfill Group contends that under the Right-To-Know Law the public has the right to attend meetings between enforcement agencies and the CLG since the Coakley Landfill Superfund Site threatens public and private water supplies of the towns of Rye, North Hampton, Hampton, Greenland, and Portsmouth. The CLG is 63% controlled by municipalities including the City of Portsmouth (53%) and the towns of Newington and North Hampton. The remaining responsibility of the CLG is comprised of a group of haulers and generators and each is separately represented. The case is a “first impression” case as there has never been an assertion that a “hybrid organization” consisting of a majority of public groups should be subject to the Right-To-Know Law. The plaintiffs assert that nothing can happen without the City of Portsmouth’s representatives agreeing. Twomey said Portsmouth has a 53 percent majority interest on the CLG committee, so if it “stayed home, put its legs up and watched the Red Sox,” there would be no quorum. Twomey asserted that the meetings between regulators and the CLG should be open to the public since the CLG is charged with protecting the public, so it’s “critically important to have access to these meetings… they’re held in secret,” Twomey told the judge. Attorney Twomey argued that “a vast amount of public money” is spent by the CLG which has a purpose of protecting public health and managing that public money. The Portsmouth City Attorney was quoted in the press that CLG had spent a total of $27M and later said the total was more like $17M. During initial access to the CLG files, documents found showed that even though the US Department of Justice warned the CLG not to redirect $5.25M designated for a remedy that would stop the flow of toxins away from the dump to settle out of court a lawsuit against a contractor, the CLG did so anyway. Separately, the plaintiffs have also asked the US Department of Justice (DOJ) to investigate the financial dealings of the CLG. We contend that the money should not have been diverted from the remedial system to settle a lawsuit, especially since the DOJ previously warned CLG not to. We are looking forward to how the Judge rules on this landmark, first of its kind, case law decision which could impact the ability of the public’s involvement in protecting their rights to clean and safe drinking water. Working on this case, I realized that when elected to Congress, one of the first things I will do is to revise the 1976 Government in Sunshine Act (Public Law 94–409) that has an exemption for activities lead by a single enforcement agency. This is a dangerous loophole especially when the head of the USEPA is a former coal industry lobbyist. For more information, go to our website at www.mindiforcongress.com. ROCKINGHAM COUNTY SUPERIOR COURT HEARS “FIRST IMPRESSION” CASE ASSERTING RIGHT-TO-KNOW WHERE… was originally published in Less Cancer Journal on Medium, where people are continuing the conversation by highlighting and responding to this story.